PlateRite 8600NII-Z/S/E | SCREEN Graphic Solutions Co., Ltd.
Productivity：High-speed exposure using fiber laser diode heads All models are equipped with high-output fiber laser diode exposure heads. These heads work with proprietary clamp technologies and an auto-balance mechanism to enable stable, high-speed exposure. The high-end Z model features 96 channel exposure heads, supporting output of up to 32 plates per hour. And plate sizes ranging from a minimum of 304 x 370 mm right up to 1,160 x 940 mm can be used. The MA-L8900 comes standard with three plate cassettes (up to five as an option) and full automation of both plate supply and cassette switching. Each cassette holds up to 120 plates, for a maximum of 600 plates stored in the autoloader. Even if different plate sizes are loaded into separate cassettes, the autoloader flexibly switches between the cassettes as required. Loading all cassettes with the same plate size enables extended periods of continuous operation. 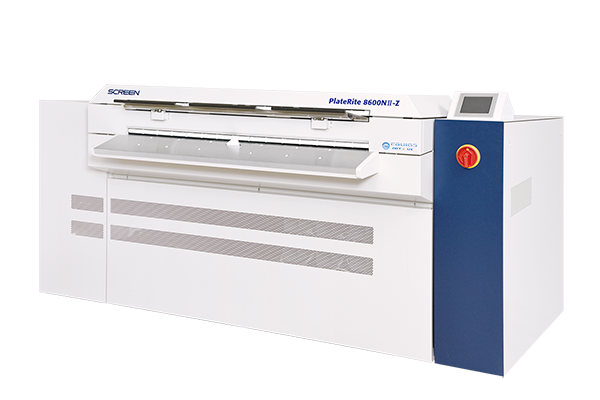 The SA-L8900 features a single cassette that holds up to 120 plates, as well as automatic detection and removal of interleaf paper. Its transport system only contacts the rear side of a plate, preventing damage to the sensitive emulsion side. Manual loading is also possible, giving operators the flexibility to select plate sizes as required. The SA-L8600E’s smaller footprint cuts installation space by an incredible 43% while its simplified design reduces initial costs. It can be loaded with up to 100 plates (thickness 0.3mm) at once. Ecology：Energy-saving design dramatically reduces running costs We assess the environmental impact of all our products as a form of design review. 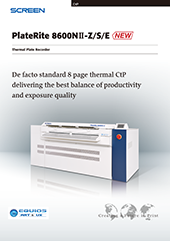 The PlateRite 8600NⅡ series has been developed with the goals of minimizing energy use and environmental impact while maximizing safety. Energy use during operation is reduced by up to 60% and also reduced energy use during standby by up to 73% when using power-saving mode. Support：Advanced support boosts system reliability Users can easily monitor and control their system from a remote location via Web browser or e-mail. An external PC can also be effectively used as a substitute operation panel to manage CtP settings. E-mails are automatically forwarded to a service center, providing an in-depth understanding of the operation status of the equipment. This information can be used during maintenance and periodic inspections to ensure the system remains in optimal condition at all times. Screen, Heidel, Heidelbach W, Protocol, and Komori punch systems are standard; all others are special orders. *1 When the punch connection kit is installed. It becomes 1,150 x 940 mm (45.2" x 37") when the kit is not installed. *2 When the punch connection kit and the small size option are installed. It becomes 650 x 370 mm (26.6" x 14.6") when the option is not installed. *3 Some plate sizes cannot be used. *4 When the punch connection kit and 8 mm clamp option are installed. It becomes 1,150 x 920 mm (45.2" x 36.2") when these options are not installed. *5 Plates which have 0.4 mm thickness must be 900 x 770 mm (35.5" x 30.4") or larger. *6 1,200 dpi uses 2,400 dpi double dots. *7 Over 4 consecutive exposures on one plate at 23°C (73.4°F) and 60% relative humidity. *8 This value is when an autoloader is connected. Productivity may vary depending on the sensitivity of the plate. The value changes when 8 mm clamps and 0.4 mm (15.7 mil) thick plates are used. *9 A separate connection kit is required. *10 One of the options must be selected.